1. Primarily, the truck u-bolts provide the force required to clamp the leaf spring and related components firmly together. In addition to the leaf spring, these components include the top plate, axle seat, axle and bottom plate. 2. The properly installed u-bolt eliminates any flexing of the leaf spring in the area between the u-bolts. This is particularly critical since the hole for the centerbolt in each leaf acts as a stress concentration which would lead to rapid leaf breakage if spring flexing was not totally eliminated by the u-bolt clamping force. 3. By firmly clamping the spring to the axle seat the horizontal forces acting on the centerbolt are greatly reduced which in turn prevents shearing of the centerbolt. 4. Proper clamping of the spring by the truck u-bolts provides the desired spring stifness and contributes to maintaining the vehicle ride height and handling characteristics as originally specified fop the vehicle. 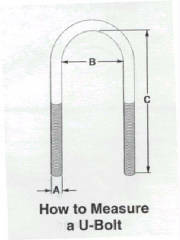 Regardless of the bend type, all Leaf Spring U-bolts are measured in the same manner as shown here. The U-bolt size is given as Diameter (A) x Distance Between Legs (B) x Leg Length (C). Additionally the bend type must also be specified; either round, semi-round or square.